The ATTY rhymes with "Patty"
Even though it might be named for a certain attorney friend of A-Designs' Peter Montessi, ATTY stands for attenuator. 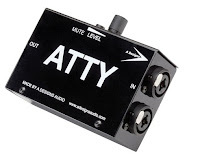 In essence, an attenuator is a device capable of reducing an audio signal. As simple as it may seem in function, the ATTY is a solid product. You can use the ATTY as a volume control for active monitors. The ATTY features a mute button for those moments when you need to take all the signal off the monitors. You can control output level on outboard gear with the ATTY. Some of us want more control over the signal level coming off of our mic preamps and other outboard gear than the designer allowed. The ATTY gives you an extra level of control. Do you own an FMR RNP? Then, you should consider an ATTY to fine tune your line level output. I used the ATTY for these different functions. It's a small, elegant black box suitable for all studio environments. It requires no power source. It's entirely passive. So, there's no wall wart and no batteries. It features two combo XLR and 1/4 inch in plugs, two XLR outs, an adjustable level control and a mute button. The ATTY is available from several retailers. The Bottom Line: Recommended. An elegant solution for getting more control on levels in the studio or live.